We are insane, each in our own way, and with insanity goes irresponsibility. Theodore the man is sane; in fairness we ought to keep in mind that Theodore, as statesman and politician, is insane and irresponsible. He is magnificent when his ears are pricked up and his tail is in the air, and he attacks a lightning express, only to be lost in the dust the express creates. Mr. Roosevelt is the most formidable disaster that has befallen the country since the Civil War -- but the vast mass of the nation loves him, is frantically fond of him, even idolizes him. This is the simple truth. It sounds like a libel upon the intelligence of the human race, but it isn't; there isn't anyway to libel the intelligence of the human race. He was in a skirmish once at San Juan Hill, and he got so much moonshine glory out of it that he has never been able to stop talking about it since. 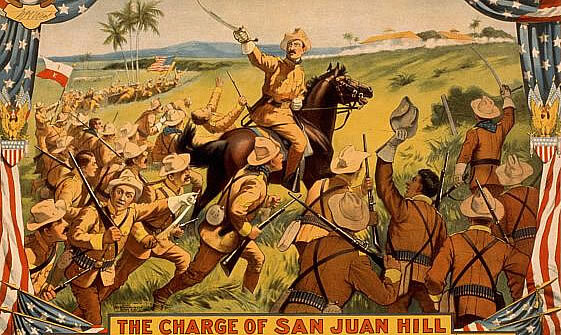 I remember that at a small luncheon party of men at Brander Matthews's house, once, he dragged San Juan Hill in three or four times, in spite of all attempts of the judicious to abolish the subject and introduce an interesting one in its place. I think the President is clearly insane in several ways, and insanest upon war and its supreme glories. I think he longs for a big war wherein he can spectacularly perform as chief general and chief admiral, and go down to history as the only monarch of modern times that has served both offices at the same time. The contrast between President Cleveland and the present occupant of the White House is extraordinary; it is the contrast between an archangel and the Missing Link. Mr. Cleveland was all that a president ought to be; Mr. Roosevelt is all that a president ought not to be -- he covers the entire ground. Astronomers assure us that the attraction of gravitation on the surface of the sun is twenty-eight times as powerful as is the force at the surface of the earth, that an object which weights 217 pounds elsewhere would weigh 6,000 pounds there. For seven years this country has lain smothering under a burden like that, an incubus representing in the person of President Roosevelt, the difference between 217 pounds and 6,000. Thanks be we got rid of this disastrous burden day before yesterday, at last -- forever, probably not. Probably for only a brief breathing spell, wherein under Mr. Taft, we may hope to get back some of our health. Four years from now we may expect to have Mr. Roosevelt sitting on us again, with his twenty-eight times the weight of any other Presidential burden that a hostile Providence could impose upon us for our sins. 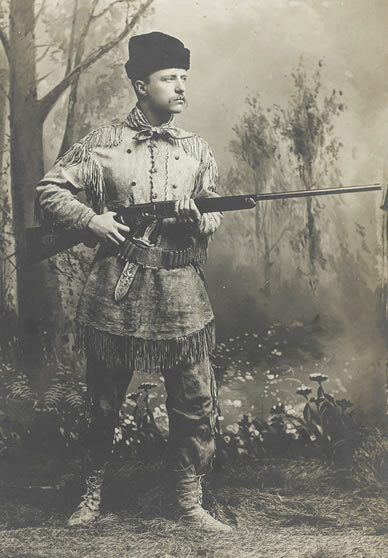 Our people have adored this showy charlatan as perhaps no impostor of his brood has been adored since the golden calf; so it is to be expected that the nation will want him back again after he is done hunting other wild animals heroically in Africa, with the safeguards and advertising equipment of a park of artillery and a brass band. - "An Article on the Inauguration of President Taft, and the Deliverance of the Country from Mr. Roosevelt" - published in The Ottowa Free Trader, 24 February 1911.